This feature generates reports based on fixed assets that have been sold by your organization. 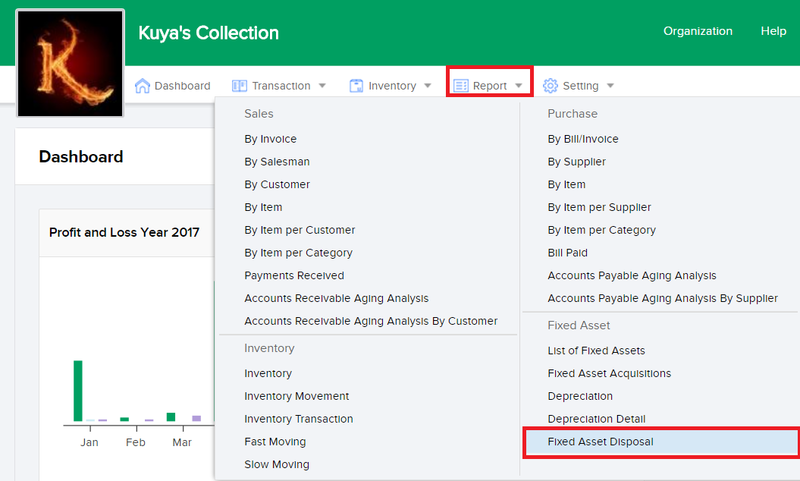 To start using this feature, start by clicking the Report tab and then select the Fixed Asset Disposal as shown below. 1. Use the From and To fields to set the time range of asset release. 2. Use the Asset Type field to filter the type of asset in your report. 3. Use the Location field to filter assets based on their location. 4. Use Classification field to filter assets based on their classification. 5. Tick the box next to Details to show details of depreciation. 6. Click View to generate reports based on your preferences. 7. Click the Print button and select Print Excel to print your report in Excel format. Select Print PDF to print your report into PDF format. 8. Click the Send Email to immediately send a report via email.